Cyndi took her nursing exams yesterday and passed. YAY!!!! She is now officially a nurse. So I made her a card. 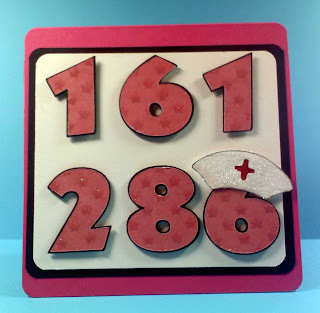 The number is her nursing license number, I cut those w/ the Mickey Cartridge font, and the nursing hat was cut using the Everyday Paper Dolls cartridge. This is a 5x5 card w/ the edges rounded. I really liked the way this turned out. How Unique! The design is awesome, but just the thought of putting her nursing license number as the main focus is really unique. Hmm. Now I need to challenge myself with something almost as unique.